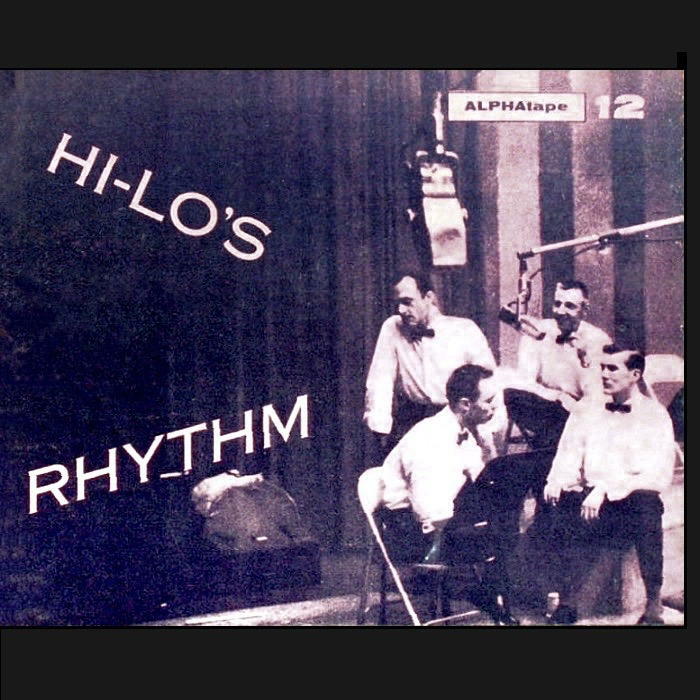 In 1954 an ambitious jazz aficionado named David Hubert formed the International Pacific Recording Corporation. Few at the time contested the fact that reel tapes offered audio quality that was superior to vinyl LPs. But reels were less convenient than plopping a disk on the turntable, and--more importantly--were costlier than 'long playing' records. Hubert announced that he would neutralize the cost differential by offering tapes at prices competitive with LPs: $5.95. 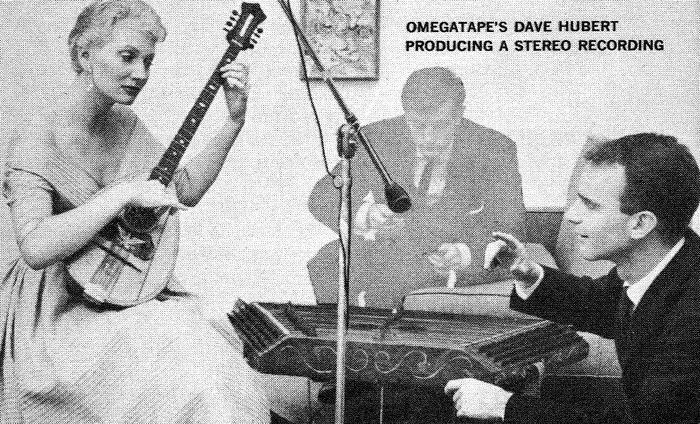 Using 5' reels for half-track mono recordings, Omegatapes initially concentrated on classics (licensed from the UK label Concert Artist, headed by William Barrington-Coupe), while Jazztapes offered dixieland and, of course, jazz, some of it leased from Jazzman and Starlite. 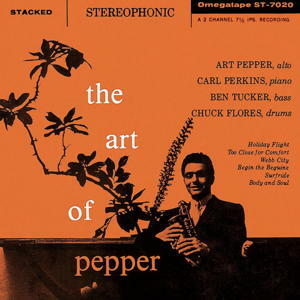 In addition, Hubert licensed 30 Latin-American titles from publisher Max Urban, The first release offered 12 classical titles, 3 jazz, and a $1 demonstration tape that sold over a thousand copies at the 1955 Los Angeles Audio Fair. By August 1955 another line was added: Alphatapes, 4' reels priced at $3.95. 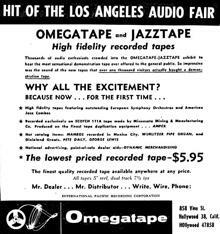 Omega's first stereo reels soon appeared (at $7.95), and the Omegatape/Jazztape mono line (now numbering 24 titles) increased in price to $6.95. Omega kick-started interest in two-channel sound with a series of 'demonstration tapes' offered for $5.95 (about half the cost of a full-length stereo reel). 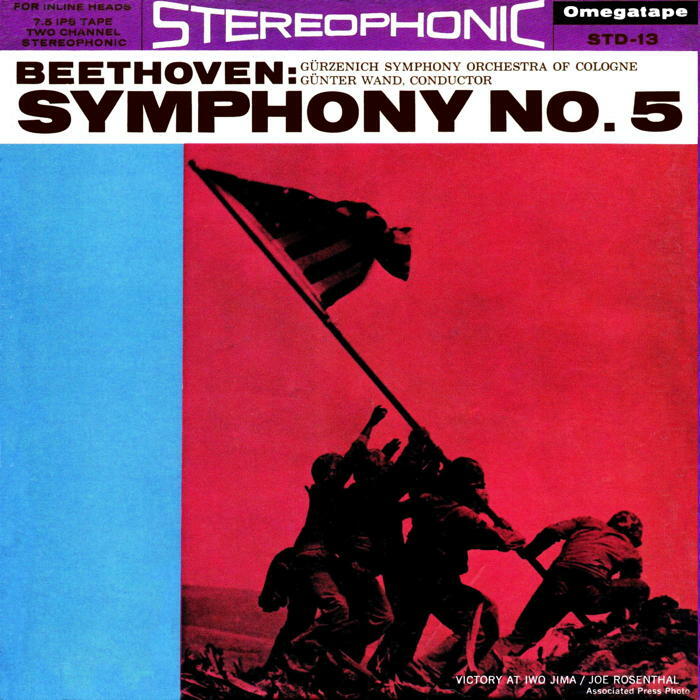 One of these would be the label's first stereo classical reel: Beethoven's 5th Symphony, the fruit of a licensing arrangement with the Club Francais du Disque. 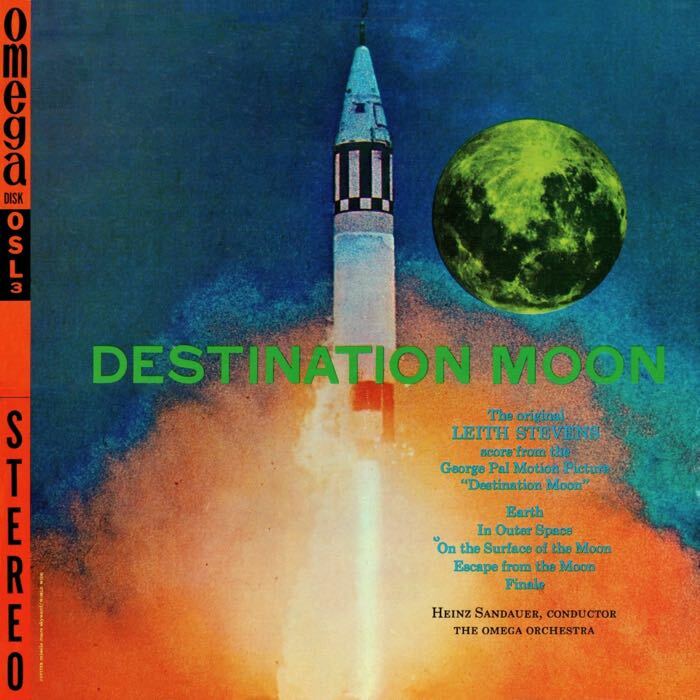 Omega arranged with several record companies (including Carlton, Golden Crest, and Crown) to release their product on reel. 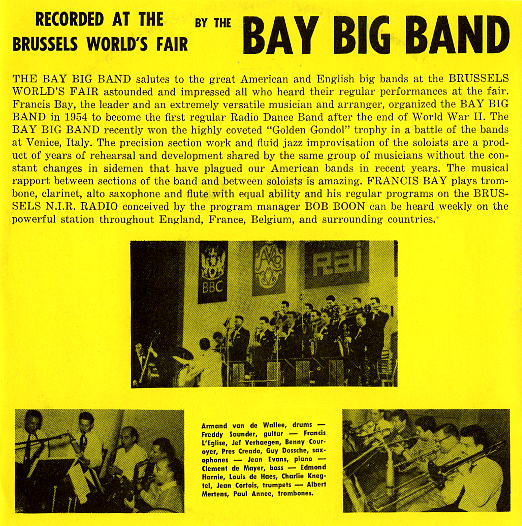 For original content Hubert produced a number of jazz recordings and beefed up the label's two-channel inventory by going to Belgium to record a series of big band tributes led by Francis Bay. Even today these tapes still impress with their sharp performances and vivid, lifelike sonics. 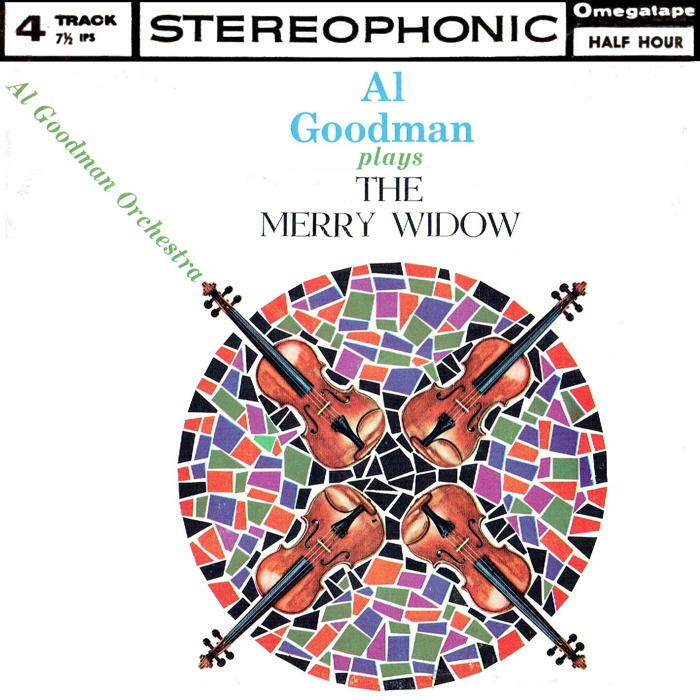 Hubert realized that stereo sound would render mono reels obsolete, so he devised a scheme to help push that process along. He offered a trade-in plan for dealers: send us two tapes (any brand or condition) and get a $5 discount on an order of ten Omegatapes. It resulted in a 25% boost in business for Omega. Hubert said returning unsaleable reels would mean that 'stereo tapes can be properly sold and exploited', adding that dealers shouldn't be 'panicked' by the talk of still-impractical stereo LPs, because two-channel vinyl would 'broaden the interest and potential for the tape market rather than hurt sales'. That was true for Omega: as of April 1958, they boasted of using 10 million feet of tape per month. Almost all of that was the Omegatape line; the Alphatape/Jazztape imprints fell into disuse. 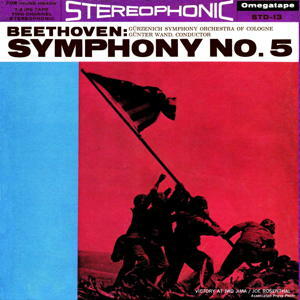 Just one month later, Omega announced that it would begin its own line of mono/stereo LPs. 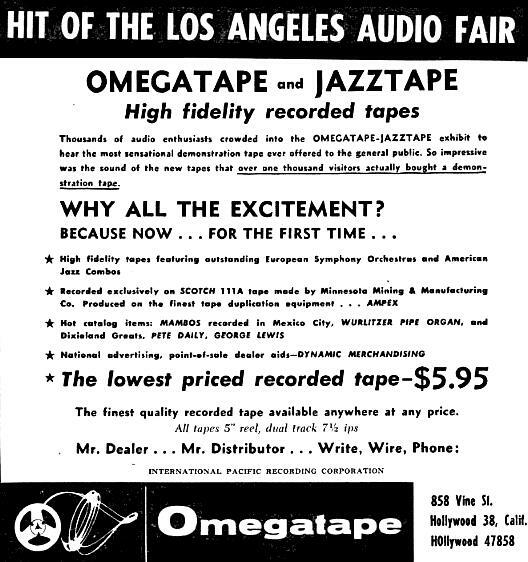 Omegadisks hit the market on May 25 1958, priced at $5.95 (mono)/$6.95 (stereo). The first releases were given deluxe packaging: hinged boxes lined with gold foil, pressed on colored translucent vinyl. These upscale features were quickly abandoned, and a little over a year later Omega cut the prices for both mono and stereo LPs to $3.98, described by Hubert as 'a more realistic price structure'. 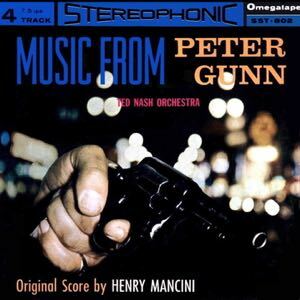 1959 bought more change to the reel market: quarter-track stereo tapes. Omega quickly joined the bandwagon and by April of 1960 the new format accounted for 50% of their sales. Half-track stereo reels listed at $9.95, while the equivalent quarter-track version sold for $6.95. 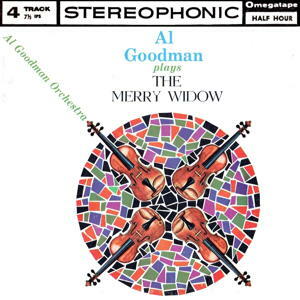 Added later was a one-hour 4-track double-program series that combined two releases on one reel for $9.95. In early 1961 it was announced that Dave Hubert had been named sales manager for Concord Electronics (whose reel tape machines would become a staple of the 60s audiophile market). What happened to Omega remains murky, but the Omegatape line resurfaced--this incarnation was now headquartered in New York instead of California with Omega alum Manny Kopelman one of the execs. The new management revived the old Alphatapes imprint and cheapened the releases. Gradually program notes were replaced by generic blurbs, and dubbing quality became inconsistent. 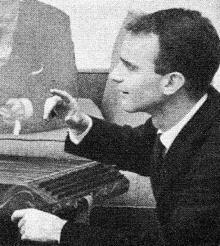 Sometime in the mid 60s Kopelman and Don McMillan formed the ‘National Record Library’ which housed the Omega masters along with material obtained from Crown, Premier, et al. In New York Omegatape declined when the quarter-track library was issued a second time (the STF-7 series), now with tracks dropped to save costs on tape, and sloppy packaging that often misattributed titles and performers. The management ventured beyond Omega's catalog and seemed to put out most anything the producers could lay their hands on. STF-7 reels started appearing as STF-3 (3.75 ips speed), and in a particuarly bizarre move as mono (MTF) tapes. Eventually the abbreviated STF-7 reels would recirculate again, on a dizzying array of cheap labels all of which had similar production designs. Some of these labels (like Empire) were off-shoots of McMillan’s National Record Library, which may have been behind the STF-7 incarnation of Omegatape. Omega's LP line did not fare any better—again the details of how it happened are unclear. But just months after Hubert left for Concord, Francis Bay recordings started showing up on Directional Sound (a product of the penny-pinchers at Premier Albums) attributed to 'John Evans'. Kopelman’s Sutton label (list price 99 cents) reissued some Omega titles without pseudonymns, replicating some of Omega's slogans and blurbs. Eventually newly pressed LPs under the Omegadisk imprint surfaced. These cut every corner possible, right down to the absence of notes, cheap covers, and increasingly shoddy pressings. The Omegadisk catalog was extended out to OSL 149, turning it into a dumping ground for material from the likes of Spin-O-Rama and Coronet (both owned by Premier Albums), often rampant with misattributions and other incompetencies. Some of these were LPs pressed for defunct labels rebranded as Omega (Celebrity, Hallmark, Sutton, Plaza etc); the sheer variety of sources makes the National Record Library a credible suspect. These disreputable discs quickly outnumbered genuine Omega LPs, burying the label's reputation in a sea of ersatz pretenders. In 1961 David Hubert began a new label: Horizon (that Concord job didn’t last long). It would eventually be absorbed by Vee-Jay, and a spin-off of Horizon (Surrey) was created to re-use the Horizon masters. 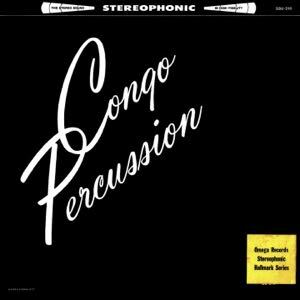 There one could find several albums by the 'Surrey Brass'--in fact Omega recordings by Francis Bay, Lloyd Mumm, and others that somehow found their way to Vee-Jay. For his part, Hubert signed with Herb Alpert's A&M, where he was head of the label's international division. After 12 years with the company he left in 1979 to create David Hubert and Associates, and was still active in the production of recordings in the digital age.